Robot | Iwatani Malaysia Sdn.Bhd. conveyor handling, palletizing and new generation Dual-arm robot. we are providing the maintenance services, engineering works and robot training. 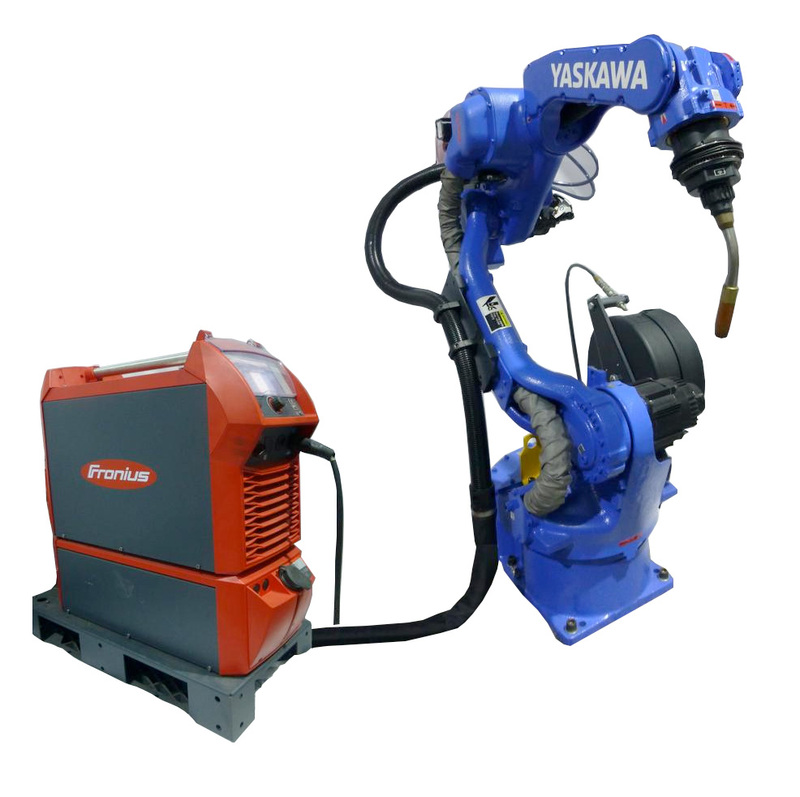 Digital inverter based welding power source developed specifically for MOTOMAN robots deliver high-qualify welding. 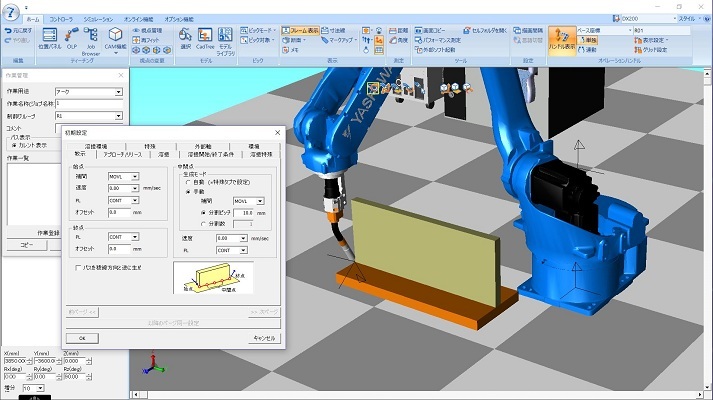 Yaskawa has raised the bar with its revolutionary "short processing" concept for spot welding with the MOTOMAN-VS, -MS, and -ES robots that are compatible with the new DX200 robot controller. Yaskawa builds optimum facilities with a complete lineup and the new DX200 robot controller. "Slim Body and Slim Arms" for easy installation in same space as human workers. The new dual-arm robot is designed to resemble the human figure. The robot has slim arms that are similar to a human's arms in size with seven joints in each arm. 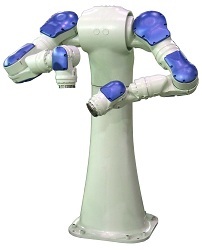 This human-size robot enables to replace the manual work to the automate operation without changing existing layout of the facility. The coordinated operation of seven axes for each arm and one at waist has made it possible to move efficiently with great dexterity requiring no further exclusive equipment for robots. "Slim Arm" for high level of freedom in narrow spaces. The SIA single-arm robot resembles a human arm. With seven joints like a human arm, the SIA robot has a highly degree of freedom and it can bend, twist, or extend itself even in narrow spaces. This enables a space-saving, high-density layout. Do you get irritated with your turntable/positioner, whose speed and accuracy can't keep up with the robot? YASKAWA has developed turntables/positioners to perfectly coordinate with the high performance of our robots. High-precision offline programming and testing now easier with the new robot simulator! MotoSim EG, a high-performance software program, saves you time and simplifies common engineering task such as interference checks and programming. 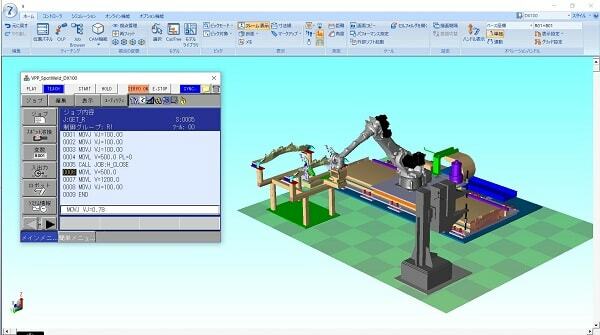 MotoSim EG enables you to construct a virtual production facility on a PC with 3D CAD data. With the latest robot models and functions, faster startup for new lines and shorter teaching times can be now realized. Ever since 1950, we’ve been developing innovative comprehensive solutions for arc welding and resistance spot-welding. Like our Cold Metal Transfer technology CMT. This revolutionary welding process has swept away one old prejudice: that you can’t weld aluminium and steel to one another. Day-in, day-out, we’re working on our vision: to ‘decode the DNA of the arc’. No wonder that we’re the welding-sector’s technological leader worldwide, as well as being the European market leader. LONG-LIFE SOLUTIONS FROM THE WORLD MARKET LEADER AND INNOVATION PACESETTER. Fronius is the strong partner that provides every robot brand, every system and every application with outstanding technologies and excellent service. We have a decades-long track record as a system supplier to all relevant sectors. In this, we insist on always delivering the same high quality, everywhere, every time. As a single source supplier, we achieve this not least through our worldwide subsidiaries, our huge store of experience and our excellent service no matter where. SYSTEM SUPPLIER WITH OVER 30 YEARS’ EXPERIENCE. At Fronius, tradition and experience are close companions. 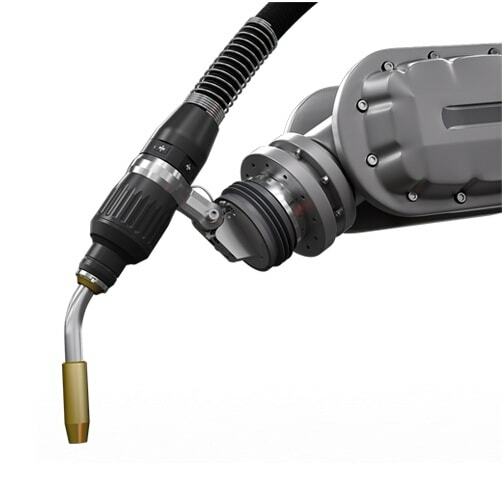 For more than 30 years now, we have been delivering superlative product quality in the field of robot welding. The close working relationships that we have with our customers and with all robot manufacturers mean that we are completely familiar with their industry and their requirements. Industrial series production has its own rules: defined quality, defined process times, defined costs. And in theory, boundless reproducibility. In reality however, there is a multitude of influencing factors that can increase reject rates or downtimes and thus impact on the overall profitability of the production operation. These include operating faults, variations in the quality of the material or the effects of thermal deformation during the welding process. If a fault is not discovered and rectified immediately, the robot will reproduce it all along the assembly line. The issue here is that the robot must be able to think in order to evaluate a problem for itself. In developing the TPS/i, we put the user’s perspective at the heart of all our deliberations; instead of developing an additional feature for a power source, we instead wanted to tailor the welding process perfectly to the needs of individuals. We also took the entire production context into consideration while improving our robot welding systems. The result: unsurpassed quality, highest efficiency and maximum reliability. In other words, profitable welding processes for all automated series production lines. Highest efficiency is possible. Now that TPS/i Robotics is setting new standards with intelligent performance. Efficiency is a prerequisite for commercial success. And this is just one area where TPS/i Robotics is setting new standards. Program setup, welding speed and maintenance provide the highest levels of competitiveness and profitability in modern series production. 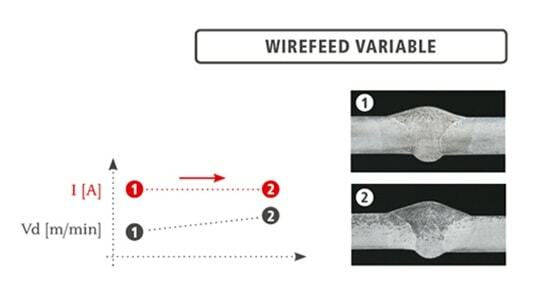 Improved heat management in the wirefeed-distance reduces the thermal load on the wearing parts. A special contact tip design also reduces the heat absorption through the arc. Exceptional welding quality is possible. Because TPS/i Robotics generates the intelligent arc. Fronius welding systems have always been the industry standard for the ultimate in quality. Our mission is to decode the arc, with the goal of producing seemingly impossible joints between materials. In addition to a range of functions that improve the arc, TPS/i Robotics ensures complete process documentation. Due to the intelligent wire control, the current and penetration remain constant if the stick out changes. The arc becomes dramatically more stable, and the penetration is much more constant. The arc length stabiliser maintains a consistently short arc, which allows higher welding speeds to be achieved. Maximum reliability is possible. Because TPS/i Robotics is the intelligent partner of the future. Progress is an ongoing process. With TPS/i Robotics, our customers are kept constantly up-to-date with the latest technology even in the future. The modular system design, the ability to update our software and the constant development of our processes are the best guarantees for future-proof production. The advanced CrashBox dramatically reduces the load on the torch body in the event of a collision, preventing damage to the torch itself. The extremely high reset accuracy allows production to be quickly resumed.